One of the best long rides to open up early is Deer Creek. 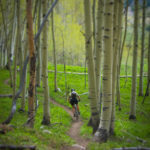 This is a fairly long ride; take lots of water and plan on enjoying the great views of the north side of Crested Butte Mountain and the East River drainage. To ride it from Brush Creek, start in town and ride south on the bike path that parallels highway 135. (Or better yet ride Tony’s and the Upper Loop and Whetstone or the Upper Upper to Brush Creek Road, then head out to the ride.) Turn left on Brush Creek Road (County Road 738) and pass the entrance to the Skyland, past Farris Creek Road and the Strand Hill rides in a few miles, and start to climb up to a Y intersection. At the “Y”, stay left and begin climbing more steeply on West Brush Creek Road. Take another left onto Deer Creek Road at the next intersection. There are signs at these intersections. Deer Creek continues to climb up a double track. Go through a gate/over a rollover at the top of this climb and continue down about 1/4 of a mile to another split in the road. Go left again and ride steeply down down through some aspens. Follow the doubletrack to its end and the start of the singletrack. After two creek crossings, the trail starts to climb steadily and steeply. 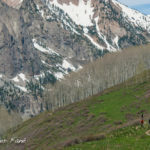 At the top, whether you’re walking or still riding, you’ll love the view of the upper East River valley and the back of Crested Butte Mountain. From here, the trail weaves and bobs its way along the flanks of Whiterock Mountain, with several descents and a couple stinger ascents, and plenty of fast rolling singletrack sections. Look for great views of Gothic Mountain out in the open terrain. The trail is usually in great shape early in the summer. Later on, cows can hammer the trail if it rains a lot. Toward the end of the singletrack, the trail veers hard left at some private property. There is a sign here, don’t miss it! Roll through meadows, then turn right on a doubletrack to Gothic Road. Turn left on Gothic Road, cross the East River ride back toward town. After a gradual, three mile climb, top out on the road climb above Mount Crested Butte. Still feeling strong? You can ride the Snodgrass Trail ( to the right) on the way back. Or you can continue on the fast road, the bike path, or the Upper loop and Tony’s back to town. Please be careful of traffic. Pinnacle Orthopedics ...where patients come first. With over 18 years of private practice experience, Dr. Elfenbein is uniquely qualified to get you back to your active lifestyle after an injury. Much like this trail has been revitalized, we'll get you back after it!! Call for a consultation: 970-672-1980.